My horse’s hooves are dry, should I do something? I often get asked by owners whether they can influence the hoof wall moisture content of their horse’s hooves either by soaking or by topical treatment such as the use of a hoof moisturiser. 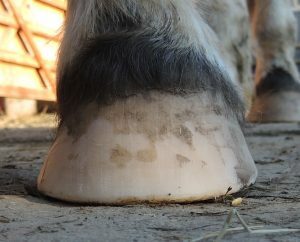 This is something that has been researched many times over the years, but there is still conflicting advice on the internet as to what is best for the hoof. Brian Hampson, of the Australian Brumby Research Unit set out to investigate whether the environment had any effect on hoof wall moisture content, and further, whether controlled soaking of the hoof had any effect (oft quoted advice for barefoot horses is that they should stand in water for 10 minutes each day). To determine whether the environment has any effect on hoof wall moisture content, Hampson studied the hooves of recently culled horses from 3 distinctly different climatic zones in Australia and New Zealand (arid desert, recently flooded semi-arid and wetland). What he discovered was that mid-way down the front wall of the hoof, the moisture content of the hooves from all 3 zones was approximately 29%, with a variation of up to 5.8% either way – there was no significant difference in these measurements between any of the groups. Hampson also carried out a controlled soaking experiment on a group of domestic horses that involved the horses standing with one hoof in water for 2 hours. 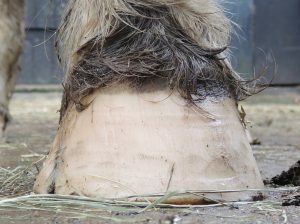 At the end of the experiment, there was no significant difference between the soaked and unsoaked hooves (the unsoaked hoof was protected from accidental splashing). He did however find a significant increase in sole moisture content following soaking. As an aside, Hampson discovered that hoof wall that was allowed to grow beyond the level of the sole was dryer than the sole by a significant amount (in soaked and unsoaked samples), and that the water content of the unsoaked sole was similar to the moisture content of the wall samples from the cadaver hooves from the feral horses. 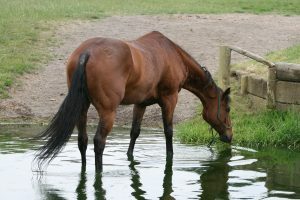 Hampson’s research into the effects of soaking reflects the findings of Sue Kempson who “has shown a definite barrier to the permeability of a water soluble tracer in the dorsal wall of the equine hoof capsule”. So, does my horse need a “hoof moisturiser”? Probably not, because of the permeability barrier found by Kempson, look at those feral horses living in the arid desert environment that Hampson studied in Australia – they didn’t require any help maintaining moisture content. But, if the hoof wall is damaged and cracked, your horse might need some protection from excessively wet conditions that allow moisture to soak further into the hoof, whilst you remedy the cause of the damage. 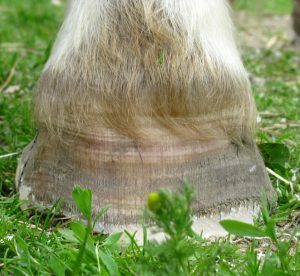 It has been my experience that dry, brittle appearing hooves (like the one at the top of the page) rapidly improve in appearance with a regular trim cycle along with good nutrition – low sugar and starch/high fibre diet, with a quality protein and a good range of vitamins and minerals, plus regular exercise (see same hoof on the right). I might occasionally recommend a topical treatment to clear any bacteria away that might be lurking in the cracks, but even the deep long crack to the left of the hoof in the top and right pictures grew out without topical treatments (see below). Hampson BA, Mills PC, Pollitt CC. 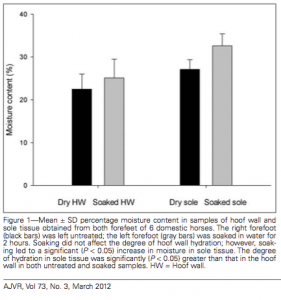 Effect of environmental conditions on degree of hoof wall hydration in horses. AJVR, Vol 73, No 3, March 2012.